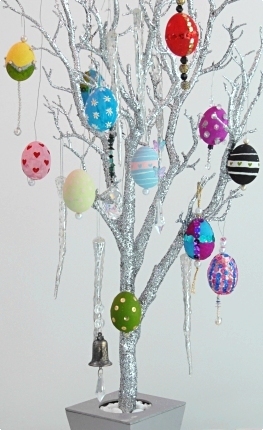 Making this fantastic Easter tree was a real team project. Everyone was asked to paint and decorate a hollow hen egg, each egg taking anything up to an hour or so to decorate. As you can imagine it was a very fun evening, and I hope you agree the end result is beautiful. We will be using this tree as our center piece at Easter. Make a small hole at each end of an egg, making the hole at the bottom of the egg slightly larger than the top, to allow the egg yolk to run through. When making the holes stick a bit of masking tape on the shell first as this helps to stop the egg shell from crushing from the pressure of punching through a hole. We used the tip of a compass as the tool to make the holes, it is the perfect width. 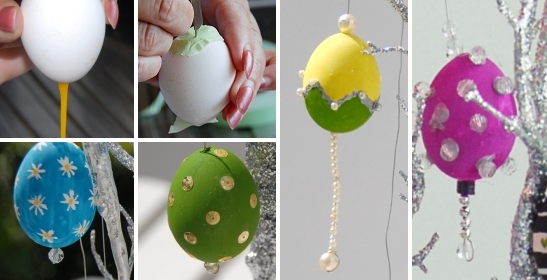 Gently push through the masking tape and egg shell. Once the holes have been made use either a thin piece of wire or a large pin to poke through one of the holes and move it around to break up the egg yolk inside. Then blow into the top hole for the egg white and yolk to empty out the bottom hole. Do this until all the egg inner has gone. Give the egg a wipe and your ready to go. 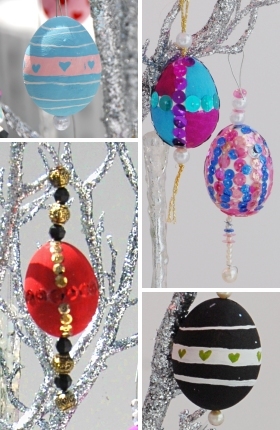 We used poster paints, beads, sequins and clear drying glue to decorate our eggs. 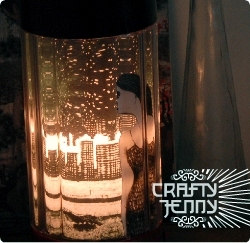 Designs and embellishments are only limited to your imagination. Ink, ribbons, bows, glitter are more materials to name a few. A great tip is to use a hair dryer as you go as it means less time waiting around for things to dry between coats. We also found thin wire was great for making the hooks to hang the eggs on the tree. Place a bead at one end of a piece of wire and secure it. Then thread the wire through the bottom hole and up through the top hole and make a hook with the excess wire. You will see how the bead at the bottom of the wire makes a little resting place for the egg and covers the bottom hole. Our tree had been bought for a decoration some time ago and wasn't being used so we have upcycled (along with the beads we used) - which is what we love doing at Crafty Jenny. Another idea for making a tree however, would be to get a small branch, spray it silver and secure it in a suitable vase. Please send us photos of your decorated eggs and we will post them online for everyone to share, and to help inspire egg designs.